About 15% of all new marriages in the United States in 2010 were between spouses of a different race or ethnicity from one another, more than double the share of 6.7% in 1980. 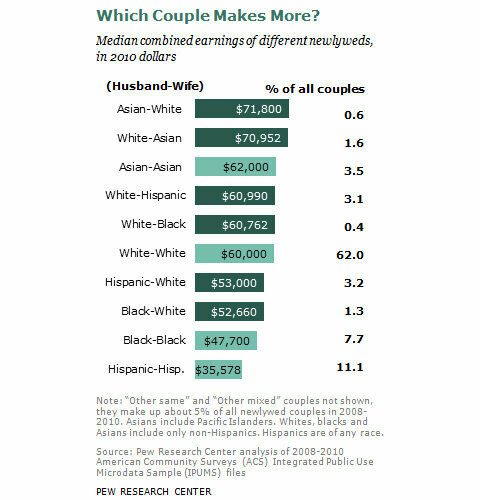 White/Asian newlyweds of 2008 through 2010 have significantly higher median combined annual earnings ($70,952) than do any other pairing, including both white/white ($60,000) and Asian/Asian ($62,000). About one-in-five (22%) of all newlyweds in Western states married someone of a different race or ethnicity between 2008 and 2010, compared with 14% in the South, 13% in the Northeast and 11% in the Midwest. The trend on interracial earnings surprised me. I would have bet a million dollars that the highest-earning couples would be Asian/Asian versus White/Asian, for the very reason that Asians are extremely motivated when it comes to education and careers, plus they are uber-conscious when it comes to money matters. However this research was done in 2010. I’m curious what the trends are for more current years. But then again, Mark Zuckerberg married Dr. Priscilla Chan so maybe the White/Asian dominance in earnings would still stand. I think the Zuckerberg/Chan union has permanently skewed that average!! yep, totally agree that the zuckerberg/chan marriage will forever skew the average! I found the geographic statistics to be interesting. I would have expected the percentage of interracial marriages in the Northeast to be higher than in the South. Let us know if you find an updated version of this study. It’s very interesting. mo, i agree that was a little strange as well. i couldn’t believe that the percentages for the south, northeast, and midwest were within 3% of each other. Definitely found these statistics to be very interesting and I do agree with Lisa and think that the Zuckerberg/Chan union skewed these results, but still would be interested in seeing the currents years numbers, too. Thanks for sharing, Catherine! i always find these wealth stats to be fascinating. kinda like being into reality tv, but for geeks. Hmm…yeah – isn’t Mark Zuckerberg one of the richest men on the planet? Still interesting info! I bet the percentages will increase over time, rather than decrease. yes, zuckerberg is crazy wealthy and his wealth will only increase. plus he is only in his thirties. there’s also some 17-year-old kid from england who sold his software to yahoo. he is sitting pretty right now too. Very interesting statistics. So the Midwest has the lowest percentage of interracial marriages! I always said the Midwest is clicky. i was surprised on the midwest having the lowest percentage of interracial marriage. i thought for sure it would be the south. i just got checked by the data, but who knows, maybe the more recent years show a different trend. my hubby is lucky he married me because before me, he wasn’t the most fiscally responsible person. a former coworker of mine grew up in a small town in the midwest. when she went to college on the east coast, she thought her dorm mate was black and her dorm mate was like, “i’m not black, i’m ‘rican!” my coworker was so embarrassed! Hmmmm…I would not have guessed this either! 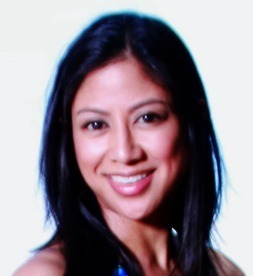 Very interesting info…I’ll be interested to hear if you find an updated one too! stats on wealth always fascinate me. it really is like following reality tv, but through numbers.